When parenting both our children, my husband and I tried to make certain they knew exactly who they were and hoped they eventually understood that the labels they carried were things they could take ownership of and apply to help them navigate their lives more effectively. Our daughter has a clear idea of the entire scope of her multiracial and multicultural identity. 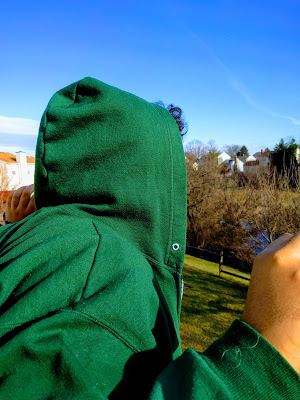 Our multiracial, multicultural, nonspeaking autistic son is 15. I have tried my best to ensure he knows his heritage despite communication challenges. I have found other ways of showing him who he is; of indicating to him it is okay to be who he is and that we are proud that he is our son as he is. We want him to know we will be doing our best to support his efforts to live an autonomous life, and such a life must begin with an acceptance of his entire identity. My son likes to watch Disney World travel infomercials on YouTube. One day he came into the office I share with him to show me a video. The video was a Disney Parks episode where parents were describing what the Disney experience was like with their daughter, who carried an ID/DD (Intellectual Disability/Developmental Disability) label. At the point where she described her daughter as having a developmental disability, my son stopped the video and put my hand on the child's image and then placed my hand on his head. I shook my head yes in response. I said "Yes, son. You are like her. She has a diagnosis of Down Syndrome. You are Autistic." He hugged me and left the room. I stared after him, an emotional mess, stunned with surprise, shock, sadness, and relief, unknowingly shedding silent tears of pride. Knowing ourselves and understanding where we are similar and different from others is a life-altering affirmation of one's competence. My son arrived at this understanding and communicated his suspicions to me without uttering a word.Grasping the scope of one's disability is a giant step in self-advocacy. To some degree, everyone needs certain labels. They form the framework of how we begin to define ourselves. But many labels are not positive or even accurate ones, and sometimes they are forced upon us. In fact it may not be the label itself but how we ascribe meaning to it in everyday usage that may devastate. Some labels carry the baggage of bigotry. Many parents who impose the goal of becoming indistinguishable from their typical peers on their autistic children feel the idea of acknowledging that their child may carry an ID/DD label is an abhorrent barrier to normalizing them. Additionally, some schools abuse the power to label a child ID/DD on IEP documents because they want to segregate the child from typical peers when said child might do better with supports in an inclusive classroom. The results of either of these circumstances are some devastating potential outcomes to the autistic student that parents and professionals don't spend enough time considering when making arbitrary decisions for or against the use of the ID/DD label. I began thinking about how many autistic students were labeled ID/DD and how they came to terms with that label a great deal after my son came to me to question his own identity in gestural language. I was trying to catch up on my friends' status posts on Facebook when I read an entire thread that brought the entire question of the ID/DD label into sharp, painful focus. It was about a family being pressured by an IEP team to add an ID label to their child's disability designations. Several people who were academics, educators, activists and autistic advocates who carried the twice exceptional label were tagged to give their input on the advantages and disadvantages of accepting such a label. I was not one of those tagged. My son carries the ID/DD label, not by choice but because that is his medical reality. If there is pressure on any family in a school setting to add this label, they need to understand that whatever they decide potentially changes the entire quality of their child's educational future, and this is not always a positive change. The aversion and abhorrence that people who should know better displayed when discussing accepting this label truly disturbed me. I'll try to explain why. I came into this world with dark skin. I am no more able to hide or deny this identity than my son is able to hide or deny his ID label. Yes, the ID label comes with a heavy burden to fight society's lifelong presumption of incompetence. There was a time when African American labels came with the presumption of incompetence as well as the false accusation that the amount of melanin in one's skin determined who was more intelligent. We dark-skinned people continue to fight these stereotypes. Being an African American woman carries lifelong challenges and injustices with it that made me more aware of ableism directed at my son. Despite the hardship, we now know that a clear grasp of a person's identity can give them self-respect that hiding it in shame cannot. The idea that because of these hardships, an identity is something that can be opted out of is wrong. What needed to be said in this thread that wasn't was does this child have a full professional diagnosis? Does that diagnosis include an ID label? If it does, then depriving them of the support they need by hiding this is like leaving a wheelchair user's chair at their departure airport. I thought it was our job to right the wrong of institutionalized presumptions of incompetence. That bit of ableism is the fundamental rock in the wall of segregation from every opportunity that keeps our loved ones from their rightful place in our society. History shows clearly that presuming anyone incompetent begins an othering of groups that slides into catastrophic abuses and oppression. There was an air of defeatism in this thread asking whether or not to allow the ID label on a child's educational record that brought me down. Our loved ones will always feel they are less than others if we simply accept the wrong-headed belief that giving a person an ID/DD label equals a lessening of their personhood. I just don't know when we will get past the idea that if a person cannot speak or learn in the way the average person can, they are less than others in society. We tend to blame our student's disabilities for our societal failure to meet their educational needs when the truth is we have not changed the fundamentals of the way we educate our children since the industrial revolution. Why aren't we fighting to rethink and redesign learning to reach ID/DD students' needs and learning potentials? We simply passively accept things as they are. And each year, our offspring are given less support and less access to learning particularly when they are made to wear that label. The largest issues I have about parental fear of the ID label and the presumption of incompetence is that if we do not fight the baggage forced on our loved ones with their neurological identity. How can we teach them allow them to carry this label with pride unless we can let our children know with sincerity that ID/DD labels are nothing to be ashamed of? I wonder if this defeatist attitude contributes to depression and anxiety in our loved ones? I also worry that denying knowledge about a critical aspect of a student's disability enables the potential devastation to the mental health of the student not aware of why they may have challenges in areas where their peers are succeeding, I wonder how much trying to opt out of ID/DD labels inadvertently slows progress creating educational methods that may maximize our students' potential because distaste for the ID/DD perpetuates our society's presumption of incompetence. It is our responsibility to make our children matter by fully understanding what accepting the ID/DD label means. They can't accept themselves if we are afraid to say whoever they are, whatever their disability constellation entails, we accept them. Believe me, our offspring feel our shame and insincerity and internalize it. We parents passionately demand better schools, better IEPs, and an end to the use of the r-word. I am thinking that we also need to take a hard look at our own attitudes and make an active effort to change them so our offspring can sense that shift organically and not internalize any subliminal ableism about the labels used to identify their neurology.